Today we’re sharing with you some of our favourite wedding finds that we’ve discovered throughout June. We hope our top wedding picks will help to inspire you whilst you’re planning your special day. How beautiful is this pearl and crystal backdrop necklace! With backless wedding dresses becoming increasingly popular there are a vast range of backdrop necklaces available to suit your style and budget, from bold statement jewellery to elegant drop pieces for vintage inspired wedding gowns. We love these personalised wedding hangers from Not On the High Street. Personalised hangers are lovely gifts for members of your bridal party. Make sure your photographer gets some great shots of your stunning dresses lined up in the morning whilst you’re getting ready. Wedding favours can be extremely difficult to choose with such a vast array of options depending on your wedding theme and available budget. 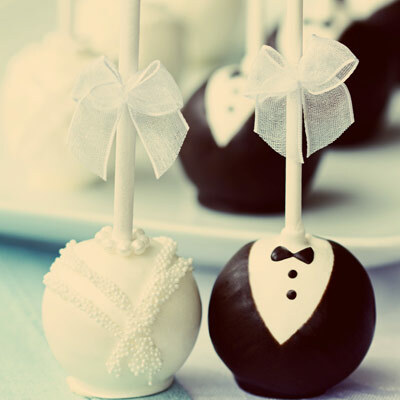 However, whatever the trend we think these handmade cake pops are a fantastic gift to your wedding guests that can be personalised to suit your colour scheme. This year’s metallic wedding trend looks set to be a strong favourite going forward into 2017. Traditional white and ivory wedding gowns are no longer expected to grace the aisle with brides favouring dresses that shimmer, sparkle and glitter. Warm tones of rose gold and copper will be increasingly popular amongst wedding trend setters across the whole event and for brides and bridesmaid’s dresses. Your wedding stationery really sets the tone of your wedding style, so make sure your wedding invites and stationery is perfect. Here at Daisy Chain Invites we have huge range of high quality, beautiful wedding stationery, you’ll be seriously spoilt for choice! 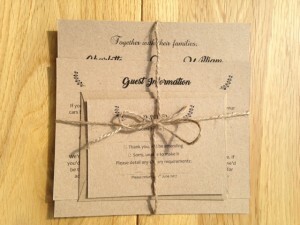 We’re particularly in love with our new Vintage Wedding Stationery Range. Take a look at our Wedding Inspiration Pinterest Board by clicking here.